I like the green color of this soda. Very pretty, nicely green. If I were going to color a kiwi soda it would totally be this color green. 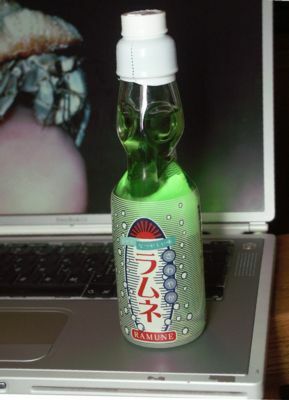 Which gets me to the point of this week’s JSF, the kiwiness of Ramune soda. I reviewed Ramune soda a couple weeks ago but for those of you too lazy to follow the link (and I hear you on that) the quick and dirty was: Meh. Kiwi Ramune isn’t any more zesty than the original. As far as sodas go, both Ramunes are carbonated but not with big happy bubbly bubbles. It’s more fizzy than carbonated which makes it taste rather flat. That could just be my American palate liking a more vibrant bubble to my soda carbonation. Another commonality between kiwi and plain is The Sweet. Ramune is just as syrupy sweet in kiwi form as it was in plain. I might not mind The Sweet if the soda was a little zippier in its bubbly but because it’s not, the sweet really comes through. They did get kiwi down pat though. The soda smells faintly of kiwi and has a good strong kiwi taste. 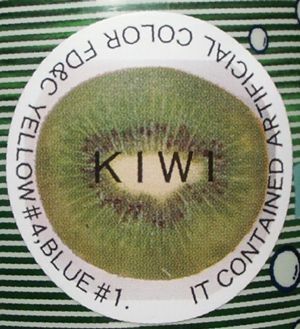 There is also a slight chemical taste but it doesn’t overpower the kiwi or the sweet. Plus, the soda is green…you gotta like it if only for the happy green. And also, take a look at the Engrish. Plus pea points for amusement! If it “contained” artificial color what does it contain now? Hee! Rating of 3 Wasabi Peas out of a possible 5.